Bali Tirta Empul Temple is Balinese Hindu temple at Tampaksiring village, the temple hae a spring water is used as the holy water for various religious ceremony at Tirta Empul Temple. Bali Tirta Empul Temple is built around the sacred spring at Tampak Siring. For more than a thousand years, Balinese worshipers have been drawn to Tirta Empul Temple whose sacred spring is said to have been created by Indra and to have curative properties. The tradition continues almost unchanged at the temple today. Over 1000 years old, the temple and its two bathing places have been used by the people for good health and prosperity because of the spring water's curative powers. It is a myth described on a manuscript called Usana Bali says that a Balinese arrogant king named Maya Denawa did not believe in god. And objected the people to worship god. Later the punishment for the king came. The warrior of Bhatara Indra arrived to attack Maya Denawa and put him away from the throne. But Maya Denawa used chemical weapons causing all the warriors of Bhatara Indra were poisoned to dead. Seeing this Bhatara Indra than planted his pole to the earth, and sprang water. This water was used to spray the dead warriors, and they alive back. So this water source until now is believed to be the source of life and prosperity. It is especially correct, if we associate this water spring with the irrigation system around the area, as it gives hundreds of hectares of rice field from Tampaksiring until Pejeng areas. The inscription mentions the construction of Tirta Empul Temple in 960 AD, when the king Chandrabhaya Singha Warmadewa ordered this which is already 1042 years ago. It seems that, this place was not interesting for ancient king but on 1954 the first Indonesian president Soekarno had built his presidential villas just at the west side of the temple. Originally a residence for Dutch officials, it was later used by former President Soekarno during his frequent trips to Bali. This villa has brought also the name of Tampaksiring become known world widely. Pool with 13 fountains, used as holy water for cremation or dead ceremony. Total number of shrines at Tirta Empul Temple are 30 nits currently, after later addition by local people who have the responsibility for the temple. The ceremony is performed every 210 days, and fixed date can be read in Balinese calendar. There is an old stone sculpture being preserved at the last courtyard of the Tirta Empul Temple in the form of buffalo. The condition of the carving is badly damage, so it can not be observed in detail to fix the type. Buffalo in the pantheon of Hindu is considered as the mount of god Shiwa and this animal is called Nandi. 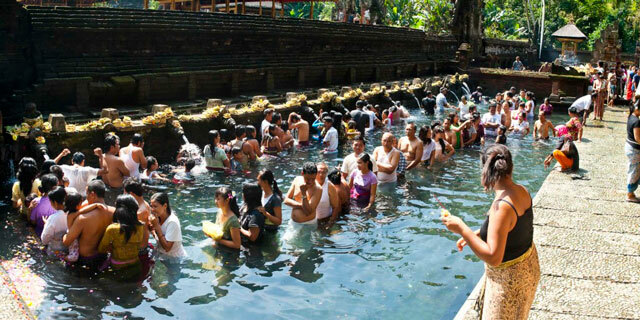 The name "Tirta Empul" signifies a crystal clear stream which is used as the holy water for various religious ceremony. Visitors are allowed only up to the main courtyard. From here, one could enjoy the twin shrines and split gate, common in most temples in Bali. Inside the inner sanctum, there are a number of bathing pools for the Hindus. 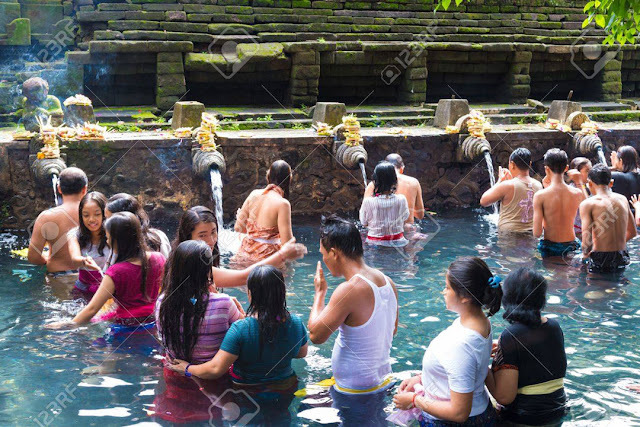 But the main attraction at Tirta Empul Temple is a long rectangular pool carved of stone, filled with koi and fed by the sacred spring via 12 fountains. Worshippers first make an offering at the temple, then climb into the main pool to bathe and pray. Many collect the holy water in bottles to take home. Nearby there are two smaller pools fed by the spring. Source: Bali Golden Tour, Matthew Williams, 123 RF.